Home » Uncategorised » Don’t mess with a pencil enthusiast. 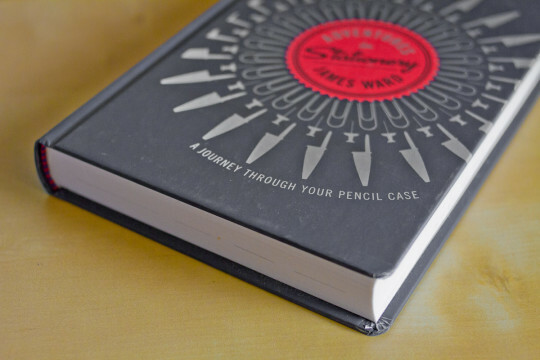 After Lexikaliker and Sean: my blog post about the Adventures in Stationery book. This book must have been mentioned in all the major British newspapers and I have to say that it’s very nice to see that there is such an unexpected interest in stationery. I hope the readers will be as enthusiastic about this book and stationery as the newspapers. Unfortunately it took unusually long for my order to arrive, but thanks to Sunday deliveries I got my copy today. I certainly didn’t expect such a well made book for under £10. Let’s take about the non-content aspect first: Hardcover, the rubbery feel to the cover which became popular a few years ago, nice, rounded corners, and amazingly well put together (and printed and bound in Italy). Even the ‘ribbon’ on the inside of the spine keeps to the outside’s colour theme. I didn’t have a good look yet, but I had a quick look at the pencil chapter and my first impressions: the content is extremely exciting. First thought (pencil chapter): nice – finally all the information that is spread across different sources offline and online in one place. It would have been nice though to see references to the original sources, e.g. Petroski’s book, Derwent’s material, etc. – but then, this isn’t supposed to be an academic article …so references might not go down well with most readers and might interrupt the flow. Second thought: What’s that – Sean being mentioned‽ That is unexpected. An analogy to Moleskine – what a good way to get the point across. The title of this blog post is a reference to Sean, taken from the book. I’m very much looking forward to reading more of this book. I too am looking forward to this book, though I’d prefer it with the UK title. sorry – WordPress somehow put your comment in the same folder as the spam. I just found out about it. I didn’t realise the book has another title in other countries. Is the quote from one of your blog posts? I’ll need to have a look.